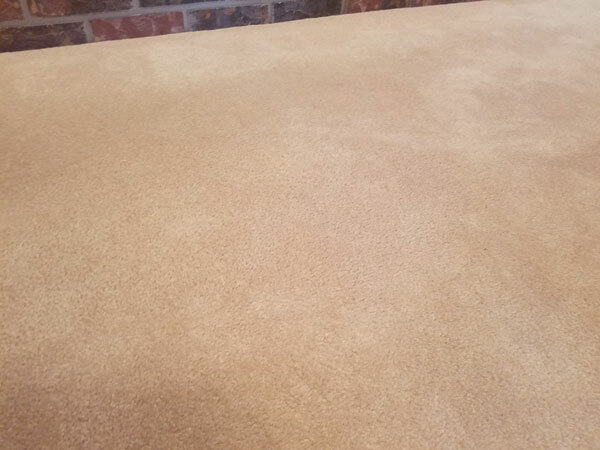 These before and after photos where taken during a bleached carpet repair in Tampa FL. The home owners had their carpets cleaned and later that evening a pretty clear bleach spot showed up in one of the main walkways of the room. 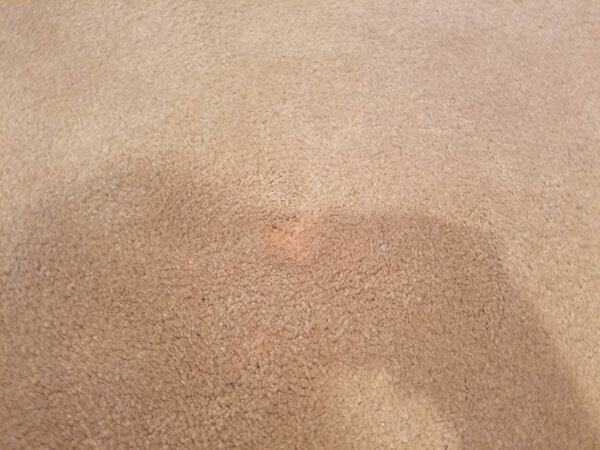 We came back to take a look at the slightly reddish spots in the carpet and determined that the carpet had lost some color due to some unidentified bleaching agent that was in the carpet for some time. If you have a quality carpet in your home with good stain resistance it can actually resist bleaching agents quite well. Sometimes a spill can take place without notice and lay dormant for years until the bleaching agent is activated by a catalyst, like heat. Then color loss can take place. That was what happen to this Tampa FL home owner. Their carpet turned a very light pink color that went all the way down to the backing. The good news is that they called us, at Chem-Dry of Tampa and were able to perform a bleached carpet repair. We actually dye the bleach spot and bring the carpet back to its original color. Using Chem-Dry's carpet spot dying kit we added the missing blue back into their bleached carpet and fixed their problem. Most people are not aware that even though their carpet is bleached it can be repaired. Carpet spot dying can save them the hassle of re-carpeting or patching with a donor swatch of carpet. If you spill bleach on your carpet don't panic. Quickly blot it up with a dry towel. Then use a damp towel to gently remove the hidden bleach. Then dry it as fast as you can. If it does bleach out while drying call Chem-Dry of Tampa and we can spot dye it to match your original carpet color. For Bleached carpet repair in Tampa FL call Chem-Dry of Tampa.